Cycling along near the Temperance Hall t'other day, I glanced over towards the town and saw that Mailboxes Etc on the corner was no more. Within the vacated shop was a sign suggesting that these premises could play host to a cafe. Twigged, yet? For that site, number 8 High Street, was previously home to the mighty Carrot Cake, easily the best Canadian themed eatery in central Ipswich. If you're feeling a tad nostalgic, we can take advantage of the Wayback Machine to take a look at the CC website (designed by my own fair hand, natch) from late 2004. Avi Kniznik, come on home! Those chunky fresh chicken sandwiches came to mind when my eyes finally resolved to show me the name of this week's light lunch destination. 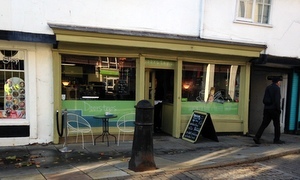 Let's do Doorsteps, a new-ish "sandwich bar and coffee shop" on Ippo's busy St Nicholas Street. You know, near Marno's and Andy's Records. Probably not much of a recommendation from someone as colourblind as myself but I'm very much liking that paintwork. For yonkers, this was Arnie's Sarnies -- "You'll Be Back" -- savoury seller to Willis workers and Axa ants. Mid-2014, along came the empire-building owners of Willy's And Milly's to open their second outlet, and rather nice it is too. Were this a straight sandwichery like up-the-road Rumbles, we wouldn't be here, of course. Provision of select seating, however, guarantees our presence. There's all manner of fillings from which to choose. Typical of yours truly to ask for corned beef which is, perhaps due to nutritional guidelines, not on offer. No matter, a toasted ham & cheese & onion on granary plus a Coke Life will more than do. Andy's a sucker for a grapefruit San Pellegrino. We grab a high table in the window to admire the arty decor and observe the many in-and-out grab-a-quick-biters. Top toastwork, too, plus a soupcon of salad on the side. Good chat with owner Judith reveals that she's a newcomer to the town, having only been here for the last 20 or so years. Obviously got her head screwed on to be in this prime spot betwixt the town centre and The Saints. What with our free half-hour spot, there's barely time to order a couple of takeaway coffees (strong 'n' hot) and first-class handmade cakes (cherries 'n' almonds). Beat a path to Doorsteps. If it was a car -- Peel Trident. If they were passing by -- Tracey Thorn.